PPI Ontology (PPIO) deals with the conceptual structures for better representing and annotating the context of protein interaction. In the context of rapid accumulation of PPI data, establishing an appropriate ontology is urgently needed to clarify the essential annotations of PPI. Motivated by this request, we proposed this innovative and precisely designed schema. PPIO is inspired by the conception of event model and consists of six core aspects of information required for modelling a protein interaction event, which are the role and state of the interactor (Who), the biological process (When), the subcellular location (where), the interaction type (how), the biological function (what) and the detection method (which). These six PPI attributes are considered the minimum temporospatial information required to describe a PPI. 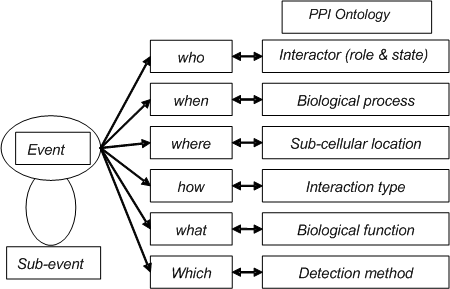 The whole PPI Ontology structure is illustrated as follows. The PPI Ontology based on event model. PPIO can provide quite essential and rich vocabularies for PPI annotation. It can benefit the communities in exchange and integration of PPI data, the PPI network analysis, PPI annotation extraction and so on. Funding: This work was supported by the National Basic Research Program of China (2017YFC0906602, 2017YFA0505002 and 2014CBA02001). © Copyright 2017-2018, All rights reserved.